YESTERDAY: TheWashCycle discusses our purple line series. 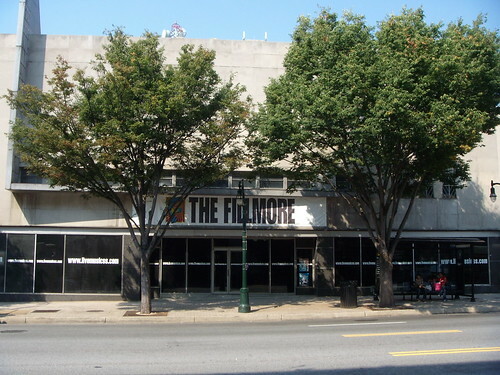 TOMORROW: Find out what some local residents and activists are saying about the Fillmore. 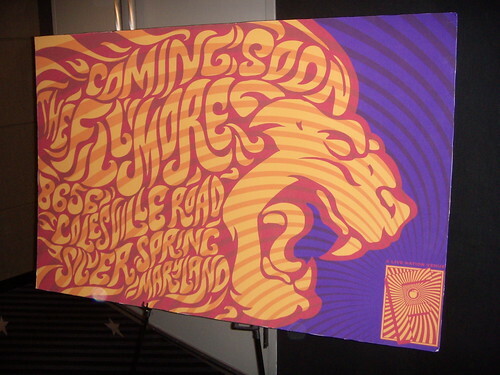 A new banner commemorates the announcement of plans to open a Fillmore music club in the former J.C. Penney building on Colesville Road. As the spurned Birchmere quietly announced plans to open a new branch in College Park, all eyes were on Downtown Silver Spring yesterday as County Executive Ike Leggett announced plans to open a Fillmore music club in the former J.C. Penney on Colesville Road. "It is a terrific day for those who play music, those who listen to music and those who want to enhance Silver Spring," says Leggett, who held a press conference at the Silver Theatre with officials from national concert promoter Live Nation and the Lee Development Group, who will be developing the club and property behind it. Keeping with a tradition that began in the 1960's, shiny red apples were handed to attendees as they left, in addition to psychedelic posters (at right)that recalled the Fillmore's heyday as a landmark in the San Francisco counterculture scene. The County expects to have a lease signed by the end of the year and for the doors to open by 2010.
a JUTP prediction comes true: so much more AFTER THE JUMP . . . In a press conference at the Silver Theatre, County Executive Ike Leggett announces the signing of a non-binding agreement to open a music club on Colesville Road. "Silver Spring will become even more of a destination point . . . where you will be able to see and hear programming you can't see anywhere else," says Ted Mankin of Live Nation. Mankin rattled off a list of artists - including Coldplay, Ricky Martin and Willie Nelson - who have played Fillmore-branded venues throughout the country. "Well, I'm waiting for Sly and the Family Stone," responds Leggett, causing an eruption of laughter. 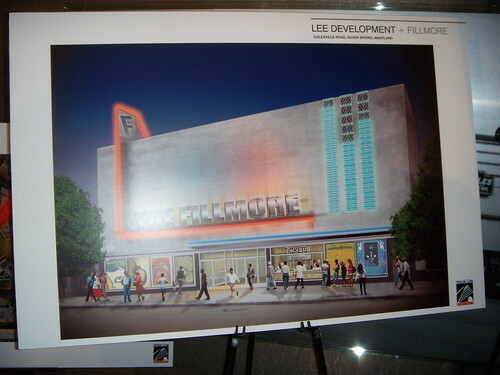 Silver Spring's Fillmore will be the first in the country built completely from scratch. It will be Montgomery County's first building with a green roof. 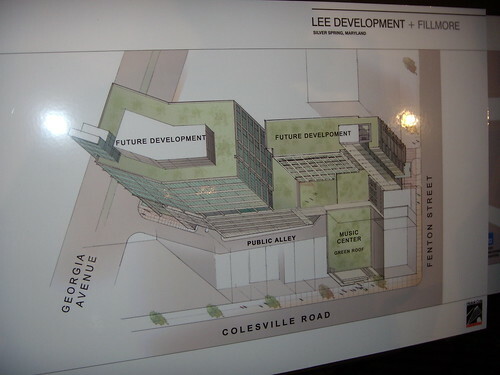 And on top of that, the club will be just the first phase of a mixed-use development (at right) at Colesville and Georgia that could take as long as eighteen years to complete. "We're taking a big risk here, and we're a little bit crazy because this has never been done before," says Bruce H. Lee of Lee Development Group, who owns most of the block the J.C. Penney is in. "This is so far outside the box that it's going to require tremendous creativity." According to the project's head architect, the cramped site will pose the biggest challenge. "It's a fairly small footprint for a venue," notes Jack Menovah of Hickok Cole Architects. "It's difficult to get that much venue into a space that small." Just Up The Pike is especially excited to hear that an equalizer display will be included in the building's façade, as we originally suggested last spring. "Bill Graham [original founder and promoter of the Fillmore] was known for his posters and light displays," says Menovah. "Anything is possible."